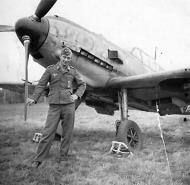 Bf 109D-1 Unit: Jagdfliegerschule 1 (JFS 1) Serial: ER-16 (W.Nr.2724) Fighter Flying School, Werneuchen, 1940. Note: application of non-standard ejector-type exhaust shroud). Send you some photos from Norway. 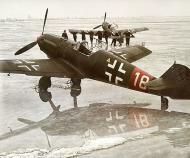 They show a Me109 D ? , that emergency landed in Ulefoss, Norway in the summer of 1940. Great pictures from Matthew: Jagdfliegerschule 3 or JFS 1 ? Photo 01-03: These photographs have been discussed a lot and the known experts can't quiet match it to any known unit. In my humble opinion the emblem seen on the aircraft could just be a variation of the LG1 emblem but the others raise a strong point so I'll go with the conses of opinion. Hi I see where your coming from, but the only Bf109 unit in the Lehrgeschwadren was LG2 with staffels 1-6./(Sch) LG2, all non-training but operational staffels (I will have to send you my Lehrgeschwader files!!). Red 17 must have come from a training establishment hence the high number. The bear with the umbrella insignia must be a hitherto unknown training unit near 1940, because the umbrella is Neville Chamberlains the British PM and the bear a German about to smash the umbrella. 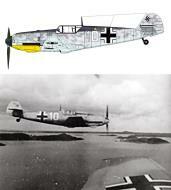 Messerschmitt Bf 109E-4 1./JFS2 Jagdfliegerschule 2 (White 1+) Norway 1940, served with JGr.Drontheim of JFS2 in Norway. The aircraft had what appears to be RLM 74/75/76 grey splinter mottle camouflage scheme with yellow fuselage and band rudder. Formed 1.4.36 in Dresden-Klotzsche as Luftkriegsschule Dresden, from Luftwaffensonderlehrgang der Heeresinfanterieschule Dresden (formed 1.35). 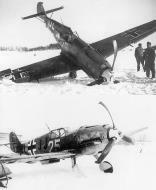 On 15.1.40 redesignated Luftkriegsschule 1 (LKS 1). Pilot training ended 10.44. Disbanded 5.3.45.